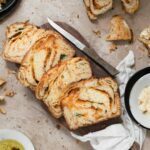 Recipe for Pizza Bread, a twisted babka filled with parmesan, pizza sauce, and chopped spinach. This bread is perfect for dipping in olive oil with a sprinkling of herbs; or just slather on some warm butter, you won't be disappointed. In bowl of stand mixer add flour, sugar, yeast, and salt. With paddle attachment on low speed slowly blend in eggs and egg yolks. Next pour in warm almond milk, and continue mixing on low until creates a dough consistency. Turn speed to medium-high allowing the dough to be “worked” for 6-8 minutes. Test your gluten activity by tearing off a small piece and gently stretching it with your fingers. Hold up to the light and if you can see through the dough without it breaking, its good to go. This method is called the windowpane test. If your dough isn’t ready, continue to work on high speed for an additional minute or two and test again. Now, the next step is something new to me, so don’t panic it works! Remove your paddle attachment and replace with the dough hook. Turn mixer onto medium-high and spoon in 1/3 of your softened butter. Be patient and allow butter to completely mix in before adding the next 1/3. It will look wet and sloppy, but the dough will absorb it. Continue with adding the butter 1/3 at a time. The dough will become smooth and no longer adhere to the sides of the bowl. Take a large bowl and spray lightly with cooking spray or rub interior with a little oil. Place dough in bowl, cover with plastic wrap and set in a warm location for 1-2 hrs or until dough has doubled in size. Once dough has “risen” place in fridge for 30 min. Prepare loaf pan (9 x 5 in) with a soft mist coating of cooking spray or parchment paper. I like to cut a long piece of parchment paper that will lay across my pan width wise, tuck into the pan and allow 2-3 inches to hang over the sides. This makes it easy to lift your bread from the pan without having to flip it upside down. Remove bread from the fridge and place on a well floured surface. Roll into a large rectangle about 16 x 12in. Take your egg wash and gently brush the edges of your dough. (this helps to bond the dough when rolling. Spoon your pizza sauce evenly onto the rectangle, leaving a ½ inch border of plain dough. This should be a thin layer, no large blobs. Sprinkle your cheese, garlic, and spinach atop your pizza sauce. Now begin to roll your rectangle inward from one of the shorter sides. Slowly using two hands to until reached the other side. Take your finger tips and softly press the seam together. Take a sharp knife of bench scraper, start an inch and half from the top and cut your dough in half lengthwise. By keeping it connected at the top, you will have less movement when twisting. Rotate your sliced pieces ingredient side up, so that your fillings point towards the ceiling. Lovingly begin to overlap your two “tails” one over the other until you reach the end. Press the end tips together. Set your prepared pan next to your dough. Lift the dough gently and place into the pan. The end pieces may be tucked under, to keep you “filling” sides on top. Cover pan with a thin towel and allow to puff for additional 30 min-1hr. Bake bread for 20 minutes. Then cover your bread with aluminum foil to prevent burning the top and continue baking for 40-45 min. Check the temp on your bread by inserting a baking thermometer into the deepest part of the bread. When it reads 190 F (88 C) remove from the oven and set on cooling rack. After 10 minutes, lift your bread by grabbing parchment paper and set it on the cooling rack. Serve with melted garlic butter and/or oil. Enjoy! !